U.S. President Donald Trump flirted with the idea of blowing up NAFTA by way of executive order. 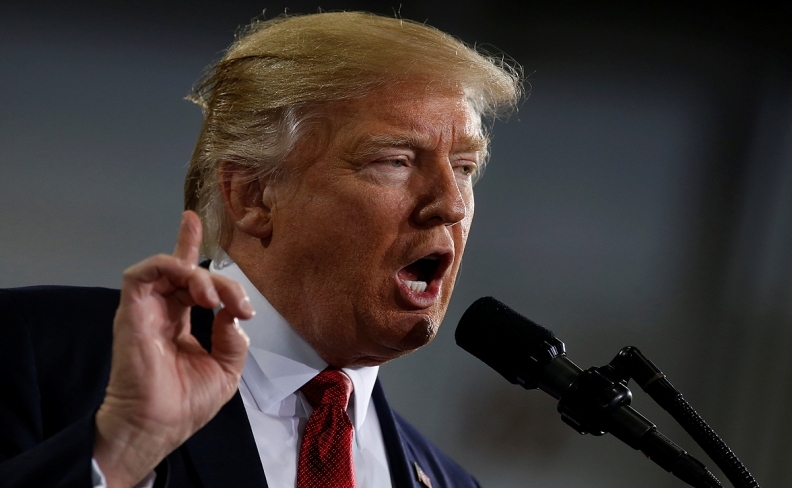 WASHINGTON -- President Donald Trump says he's ready to start a major renegotiation of the North American Free Trade Agreement, now that his trade czar has achieved his long-awaited confirmation by the U.S. Senate. The upper chamber voted Thursday with a large bipartisan majority of 82-14 to approve Robert Lighthizer, giving the administration its U.S. trade representative and allowing it to finally kickstart its NAFTA process. The president said during an interview with The Economist that he intends to proceed quickly thereafter: Trump intends to file a 90-day notice with Congress, work with it on negotiating priorities, and start talks with Canada and Mexico later this year. "The clock starts ticking (with Lighthizer's confirmation)," Trump told the magazine. The administration has begun signalling that it wants significant changes in a range of areas, including automobiles, dairy, lumber, pharmaceuticals and the dispute-resolution system. "Big isn't a good enough word," the president replied."Massive." But that desire for a "massive" renegotiation is butting up against the mundane realities of the political calendar. The U.S. and Mexico have both expressed a desire to get a deal by early next year, before the Mexican election, but few observers believe a substantive renegotiation is possible within a few months. Trump repeated the story in that interview of how he almost withdrew from NAFTA last month. It's a story he's told several times. He described an amazing coincidence: Both Prime Minister Justin Trudeau, and Mexico's Enrique Pena Nieto, called him one after the other, and both told him almost the same exact thing, urging him to reconsider. "I have a very good relationship with Justin and a very good relationship with the president of Mexico," Trump said. And I said, 'Yes, it is. Absolutely.' So we did that and we'll start." There's a simple explanation for that coincidence: It wasn't a coincidence. Trump's own son-in-law Jared Kushner set up the Trudeau call. One source familiar with the thinking of both governments offered a theory for what's happening: Trump wanted to take credit, before his 100th day in office, for forcing Canada and Mexico into a renegotiation. The source said the governments of Canada and Mexico did the exact same thing as some companies like Ford and Japan's SoftBank; they let Trump take credit for things they already intended to do. In the case of the companies, it was building U.S. facilities. In the case of Canada and Mexico, it's renegotiating NAFTA, which both countries had repeatedly stated they were ready for. "That's what everybody's doing," said the insider. "(People are saying), 'We're gonna let Trump have the announcement, so he gets credit for it'...They've decided, if they need to give him some victories, as long as it suits us, fine. "As long as they're not actually, in reality, getting screwed, he can say whatever he wants." "President Trump is eager for some wins. Canada can help provide him with one, while also advancing its own interests," Maryscott Greenwood of the Canadian-American Business Council wrote in a Policy Options article. "The Canadian government could present the United States with a proposal for aligning a particular set of regulations. This would represent a bilateral victory for what is at the moment a U.S.-only effort to cut regulatory red tape."